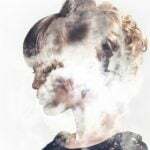 To achieve gorgeous, flawless looking skin, there’s many steps we need to take: the right face wash, a good moisturizer, the perfect makeup for our skin type, and sunscreen. Sunscreen is sometimes dismissed, but we need to remember how incredibly important it is! Not only will it help to keep our skin safe from harmful rays from the sun, but will keep our skin looking young and fresh. And just because you have acne prone skin doesn’t mean you should stay away from sunscreen- it just means you have to stay away from the extra greasy ones! 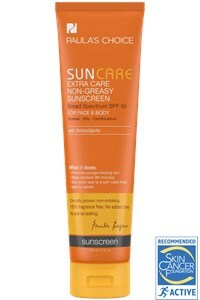 Check out these 7 Best Sunscreens for Acne Prone Skin. Lightweight and instantly absorbed,L’Oreal Sublime Sun Advanced Sunscreen leaves a perfect finish that will protect from the sun without the greasy effect of most sunscreens. Enhanced with vital ingredients like vitamin E and white grape seed, your skin gets the hydration it needs while staying safe from the sun all day long. There’s so much to love about this sunscreen, from its glorious silky smooth finished to its long lasting, outstanding SPF 30+ wear. And it’s only $7.99! Neutrogena is always an excellent option when it comes to finding the right skin care products for acne prone skin. Complete with helioplex broad spectrum uva-uvb protection and SPF 30, your face (and body!) gets the protection it needs without the grease, oil, or breakouts. It has an extremely lightweight finish that provides a weightless matte finish so skin can breathe easily- and those of you who suffer with acne know how incredibly important it is to let skin breathe! 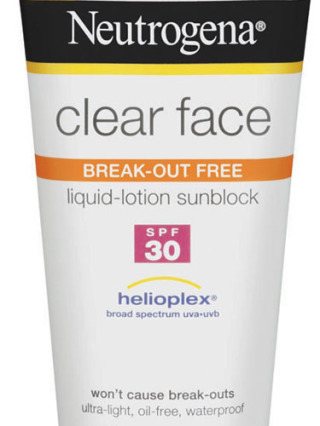 For impeccable protection that won’t wash off even in the water, you need the Neutrogena Clear Face Break-out Free Liquid Lotion Sunblock for $9.99. For those of you seeking vegan skin care products or a product that is perfect for gluten-sensitive individuals, this is definitely the product for you. DeVita Solar Protective Moisturizer SPF 30 is not only an excellent option when it comes to fighting off rays from the sun, but it also acts as a daytime cream that hydrates, moisturizes, and smooths, for gorgeous and soft skin that lasts all day. It absorbs quickly and can be worn alone or under makeup. You will love how gentle this vegan, paraben free sunscreen is on your skin and the amazing effect it has on your face. A wonderful product for only $13.77. 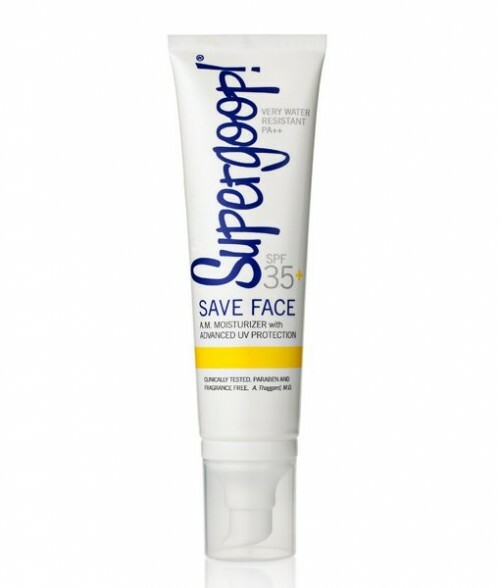 If you’re looking for an all-in-one product that can do it all, here is your answer: Supergoop Save Face Oil-Free Moisutirzer SPF 35. This product can seriously do it all. Created with blueberry antioxidants, vitamin E, avobenzone, this fantastic product has the power to improve skin texture and elasticity while protecting from free radicals and sun damage. It’s completely oil free and non-comedogenic so it won’t clog your pores or cause any unwanted irritation and breakouts. 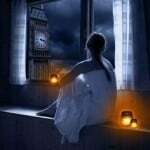 Didn’t I say it was perfect? Well worth the price tag of $28! 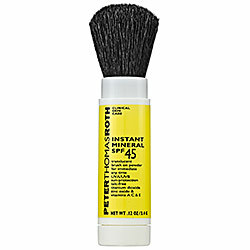 Boasting an astounding SPF 45 and being incredibly unique and handy, Peter Thomas Roth Instant Mineral Powder SPF 45 is the sunscreen powder you need in your bag or tote. 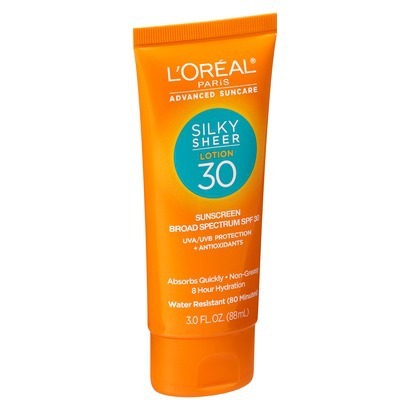 Unlike other sunscreens, this uniquely designed product doesn’t go on like liquid or gel. Instead, it acts like a regular powder and can be applied throughout the day for easy touch ups. People across the globe adore this product because it’s quick and easy and provides a super lightweight feeling that leaves your skin looking youthful and fresh. Definitely worth the $30! Murad is another one of those companies that many people run to when their skin is in stress. 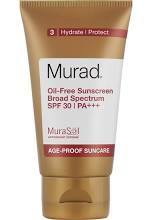 That being said, it’s only natural that the Murad Oil-Free Sunscreen Broad Spectrum SPF 30 would make the top 7 list! This wonderful product is simple and to the point: it will give you the best protection against the sun without causing and irritation whatsoever. Completely oil-free so you can forget about grease, this sunscreen glides on smooth and absorbs quickly for a lovely matte finish. For a product that will get the job done no questions asked, this is the answer for only $32. For my more active readers who love to do a lot of strenuous activities outdoors, this one is for you. I introduce you to the Paula’s Choice Suncare Extra Care Non-Greasy Sunscreen, otherwise known as the sunscreen that will protect even when the sweat pours out! Completely water resistant and boasting SPF 50, this lovely product is designed for blemish prone skin and is completely oil free. You will be shocked how utterly smooth and lightweight this product feels, and it can easily be worn under your makeup for all day protection. Love it for just $17!